Two weeks ago, the World Bicycle Forum in Medellín, Colombia brought together more than 4,000 attendees from across the globe to discuss the challenges and opportunities of urban cycling. Many have praised the event for its ability to bring a wide swath of constituencies together and identify key outcomes. Cities and citizens are turning to the bicycle for good reasons. The bicycle offers a healthy form of mobility that cuts the need for car travel and reduces emissions. But there remains a major obstacle to establishing cycling as key mode of travel: designing safer infrastructure that all people feel comfortable using. A workshop co-hosted by EMBARQ and the Cycling Embassy of Denmark at the World Bicycle Forum focused on the design principles and conditions that enable safer cycling. Participants drew lessons from global research on urban design, road safety audits and inspections in cities on the ground, and academic research on safety and cycling. At the city level, a cohesive network of bicycle facilities that connects parks, streets, waterfronts, and other vital corridors is necessary for ensuring safe cycling conditions. Copenhagen’s well-known network is a great example of this kind of comprehensive planning. A similar network is emerging in Minneapolis, where on-street buffered and protected bicycle lanes are expanding the city’s already renowned off-street trail network. Bogotá, Colombia has nearly 392 km of bicycle lanes, 232 km of which were built during the Enrique Peñalosa administration from 1998 to 2001. According to the recently released bicycle account for the city, cycling in Bogotá has steadily increased from around 0.5 percent of daily trips in 1996 to 6 percent in 2014. Overall, in fact, Latin American cities actually have some of the most extensive cycling infrastructure outside of Europe. 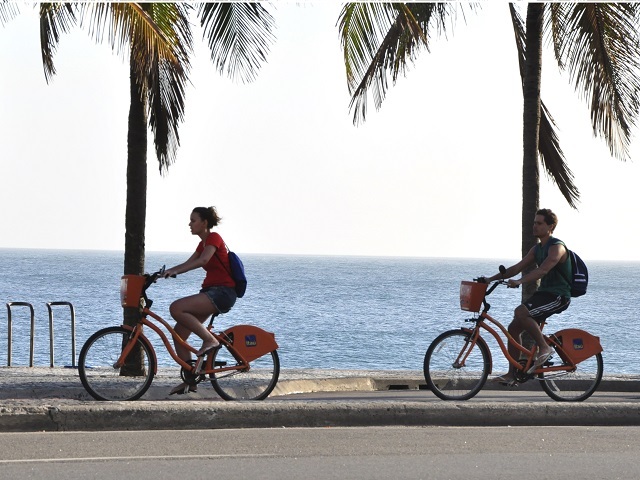 A recent report by the Inter-American Development Bank and Despacio indicates that Latin America’s 56 largest cities have a combined network of 2,513 km of bicycle lanes between them. At the street level, physically segregating bike lanes—with bollards, curbs, or raised tracks—can create safer conditions for cyclists. These concepts have already been put into practice and their successes are documented in city and national guides, like Copenhagen’s Focus on Cycling and the Netherlands’ CROW Design Manual for Bicycle Traffic. Increasingly, these guides are becoming more popular at a global scale, from the United States to Turkey. In Brazil, Rio de Janeiro has helped reduce conflicts between pedestrians and cyclists by raising the bike lane and moving it behind a bus stop refuge. This design strategy is also recommended in a guide on cycling design prepared by EMBARQ Brazil. Yet with protected lanes, problems can arise at intersections and access points where motor vehicles turn or enter into areas with pedestrians or cyclists. In Mexico City, a prime example of safer street design can be found on Avenida Eduardo Molina, where 20 km of one-directional protected bicycle lanes line both sides of the street, across from a center-median bus rapid transit (BRT) and rebuilt sidewalks. Although some cities have installed bi-directional lanes, the one-directional lanes are usually preferable, as they do not induce unexpected counterflow bicycle traffic at intersections. Mexico benefits from having both a city-level bicycle strategy, developed by the Secretary of Environment, and a national level guide called Ciclociudades, led by ITDP. Another way to improve safety at intersections is to provide two-step turns, in which cyclists do not actually make a left hand turn in one move, but move instead to the intersecting street and wait for the signal to proceed. A study from Beijing shows that the introduction of two-step turns led to a 24 percent reduction in conflicts and crashes. Moreover, efforts that raise visibility between bicyclists and motor vehicle drivers will reduce the chance of impact. These aren’t the only tools that can help produce a safe, comfortable environment for cyclists, but they do represent an important starting point. While other strategies should be considered, cities should recognize that lowering traffic volumes and speeds is essential to ensuring greater safety and higher rates of cycling. Ultimately, safe cycling design is about developing a system that people will use. Considering the engagement and energy at this year’s World Bicycle Forum, and the expected progress we’ll see at next year’s forum in Santiago, Chile, this vision may not be that far off from becoming reality.